Jacob loves his Stretch Armstrong, he takes it everywhere with him, even to school. 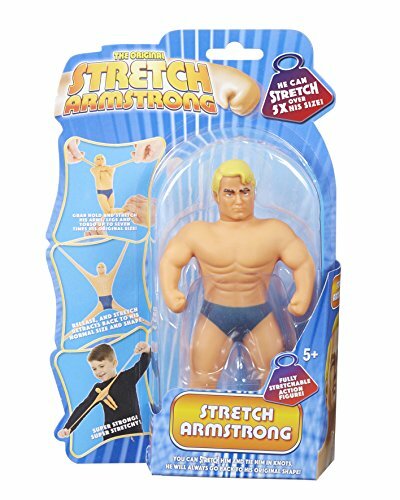 Stretch Armstrong looks just like a wrestler, and Jacob is into wrestling at the moment. He has loads of super Stretchy fun. The kids love seeing just how far they can stretch him, and they can stretch him pretty far! They tie him in knots and bend him in all sorts of positions. They have tons of fun and laughter trying to, I don't know what, but probably trying to see how far they can stretch him without breaking him - but he is pretty unbreakable! After all this crazy pulling about, Stretch Armstrong returns to his original shape - it's pretty good. I really like how Mini Stretch is smaller than the original, it's also less heavy, which makes it more portable. He measures at 7-inches, but is made with the strongest formula yet! You can stretch him 7-times his original size, and the kids certainly try and test that out.